Claude Monet is a famous painter and founder of the French impressionist art that has become quite famous globally. He did several artworks in different disciplines. His creations are still selling to date and are reputed for their depth and high quality. 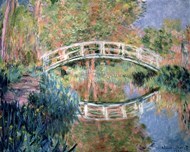 Claude Monet also made several Monet landscape images that capture gardens, mountains, water bodies, among other features. "Tulip Fields at Sassenheim" by Claude Monet is one of the many Monet landscapes paintings in our gallery that can be used for wall decoration. The painting captures tulips in the field and has blends of green, red, blue, and a host of other colors. 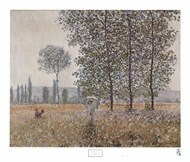 Claude Monet is known for having documented the French countryside through many paintings that portrayed many of the things found in the French countryside then. He was known for consistently expressing the works of nature through art. You can use Claude Monet landscape paintings to derive captivating inspirations and a great adventure of the French landscape. Their diversity in terms of color and content makes it easier for one to use them in any interior decoration work. When selecting these images for your interior design, you need to first establish the amount of space you have on your wall and the kind of theme you’ve implemented so far. 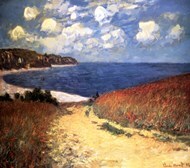 Another important step is enriching your selected Claude Monet landscape pictures by canvas printing, framing, or laminating them. By printing the images on canvas, you make it possible to use them in different interior designs. On the other hand, framing your preferred Monet landscape painting allows you to choose the frame color and a host of other elements thus giving you some freedom in building your design.